I think it is safe to say that I have a small obsession with Anchors! I was so excited when I received this anchor Bracelet from Poshlocket. I have been wearing it non stop! Enter my Poshlocket giveaway here for a chance to win a $35 gift card and be able to choose from all of there amazing jewelry! The giveaway ends Friday night! Its also safe to say that I am obsessed with this new MAC lip color that I got a few weeks ago! I think I have worn it everyday since I got it. It is the perfect coraly pink! If that makes sense! I strongly suggest trying it out! Oh and can we talk about how I much I am obsessed with my J.Crew Panama hat! I wear mine all of the time! Especially on bad hair days! I really want to get it in white too! Beautiful! That top is so lovely!! I have been wanting to try out the fedora hat for quite some time now, but was never really sure what to pair it with...this outfit is perfect! 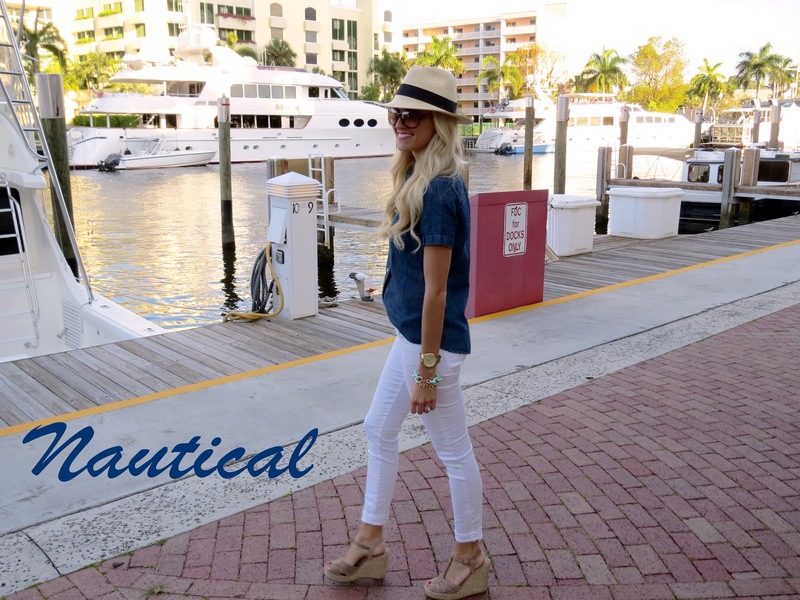 Nautical is definitely one of my favorite looks, so classic and chic, and the Panama hat adds a breezy laid-back twist. Love! So excited for warm weather just to pull out my jcrew panama hat! Love it styled here! This outfit is adorable. I love chambray with white jeans. And I can't tell you how much I love the Panama hat. I've gotten so much use out of mine. I have a giveaway on my blog today. Would love if you came and entered. XO! I love the nautical trend once the weather starts getting warmer and that anchor necklace is so darn cute. You look great Jade, perfect for a day on the water! i love this nautical look. one of my favourite trends for spring!